Here it is, my first animated music video! Please leave comments and share it! We premiered “Fox on the Town” last night at The Old Town School of Folk Music and Tangleweed played live to the video. It was neat to see it on the big screen and people seemed to enjoy the video. In my head I tried not to pick at it too much and just enjoyed the experience of sharing it with a bunch of people for the first time. For me this was a learning experience and I’m just going to get better from here. Here’s some history/info about the video: I started learning how to use Flash probably about two years ago. Paul was a regular at a cafe that I worked at so we would chat while he waited for his panini. I found out he was in a bluegrass band and he found out that I was an artist. During that time I told him I wanted to animate music video’s. He gave me their cd’s and I originally chose to do “Mississippi Trashboat” but I think I hem-hawed too long. I didn’t feel ready to start on a big project, there was still too much to learn. Tangleweed used me to create two coloring books during this time…then finally Paul gave me a song and said animate this in 4 months. I spent about 10 to 15 hours every week on the project working scene by scene. I didn’t have time to storyboard or do any pencil tests. I did all of the artwork in Photoshop then had to put all of the character drawings in Illustrator so they wouldn’t have white halo’s. Finally I put it all together in Flash. The animation is a literal interpretation of the song. While I was working on this I did see Tangleweed perform live and watched videos of them so I tried to capture their core movements. 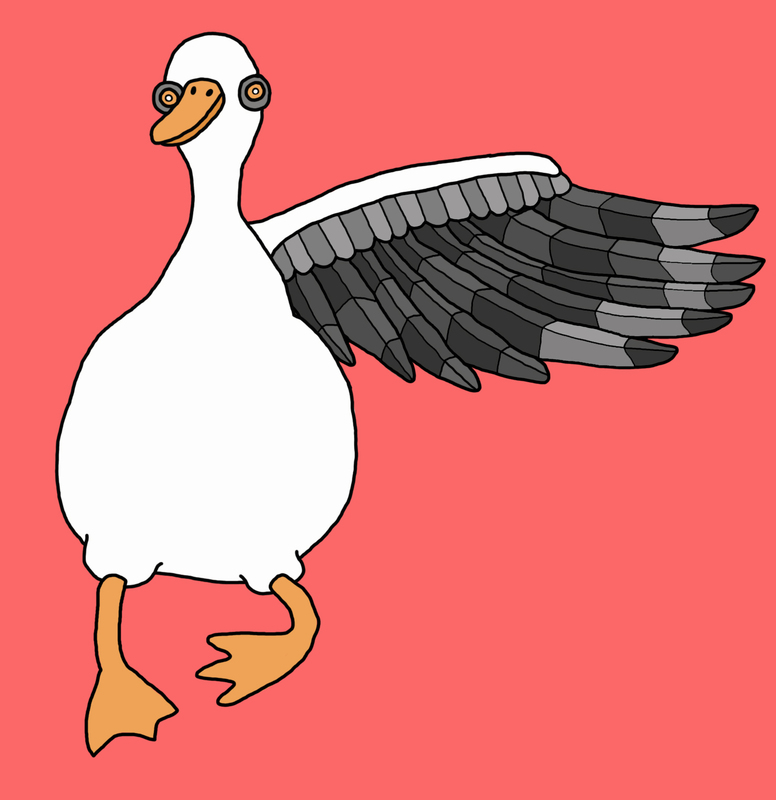 Part of a goose for the music video. For this one I only drew one wing and to save time I’m just going to duplicate it and flip it horizontally. Go West, Love Bunni, Go West!